WELCOME TO THE SPORTS CONNECTION KIDS CLUB! 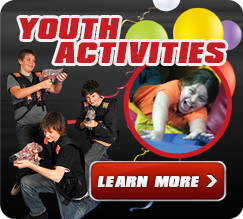 Sports Connection Kids Club Members receive FREE Game Card Value each year and other Monthly Specials and Discounts as well as an opportunity to attend one of our “Kids Club Only” Private Parties. Membership is FREE for all kids ages 3-12. Just fill out the Online Kids Club Registration Form and then stop by our Ballantyne or Northlake Family Entertainment Centers any time between 12 pm- 8 pm to pickup your Kids Club Packet. Please allow 24 hours after submitting your application for us to process your registration and create your Kids Club Card. SC Kids Club Game Card & Lanyard. $15 of FREE Game Value when you register. Additional $15 Game Value Each Year by bringing in your card to our Ballantyne or Northlake Family Entertainment Centers. Registration of your Kids Club Card so if you lose or damage it, we can easily replace it, as well as any money or ticket value on the card. If you have other Sports Connection Game Cards, just bring them all in and we will combine them all onto your Kids Club Card. Other FREE Coupons & Discounts. Some possible examples include: FREE Attraction or Ride, FREE Jump-N-Play Admission, FREE Ice Cream, FREE Redemption Tickets, Discount for Summer Camps, Discount for Birthday Party, etc. Other Monthly Specials - See Below.